The national office has developed a resource to help affiliate leaders access membership information: the Affiliate Portal. It is connected to the national membership database and provides contact information for the affiliate members. Remember, many of these members were never chapter members before and affiliate membership is new to them. 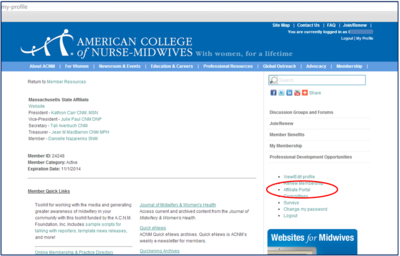 To access the Affiliate Portal, log in to www.midwife.org at the top of the page using your username and password. Once you have successfully logged in, click "My Profile" located on the upper right side of the page beneath your name. From this page, the link for the Affiliate Portal can be found along the right hand side of the page with other useful links. Excel file of all current affiliate members, including names, contact information, and membership data (click Export to CSV File in the Reports section and then click the Create Report button). Select the type of report under "Report Type"
Select the "Membership Category" (for a list of ALL members in your affiliate, leave blank).At this point, depending on the type of report or the information you are looking to gather, you can add filters to the report (more below). The remit report allows the affiliate to see which members have paid their dues. The national office remits affiliate dues to the affiliate on the 20th of the following month. Affiliate leaders are encouraged to run the remit reports monthly and balance these against their bank statements to stay abreast of which members are current with their dues. 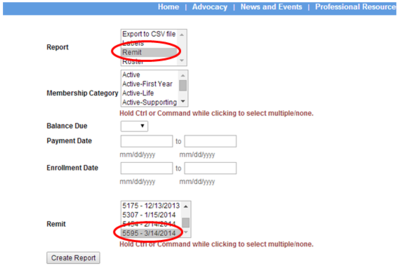 To run a remit report, select "Remit" under "Report Type" and the specific month under "Remit," then select "Create Report." The "Membership Category" function allows you to limit a list to a particular segment of the membership. Want to send something to just the student members in your affiliate? Simply click the type of report you want to run, then under "Membership Category", select "Student" and the report generated will contain only students. Want to run a list of ALL members in your affiliate? You can either leave the "Membership Category" list blank or hold down the CTRL key and select them all. Either option will generate the information you are looking for. The Affiliate Portal allows you to modify the reports generated to get the exact information you need. After you select the "Report Type" and "Membership Category," you can decide if you would like to see only members with a "Balance Due" by selecting either YES or NO. ACNM sends initial membership renewals out 4 months before a membership is set to expire. When you select YES in the "Balance Due," the system will pull any member that has received a membership renewal notice, even if their membership is not expiring for 4 months. "Payment Date" allows you to pull a list of members that have paid dues within a specified time frame. To help you identify and connect with new members of your affiliate, we have added an "Enrollment Date" range report modifier. You can now select the type of report you would like to run, enter in a range of dates in the "Enrollment Date" boxes and select "Create Report." The report generated will only be those members that are new to ACNM and new to your affiliates within the specified date range. This report will give you the opportunity to reach out and welcome the new members to the affiliate, alert them to upcoming events, and inform them of the different ways they can become involved in the affiliate. Reaching out to the members, especially new members, is the first step in engaging them. Many of our affiliates use the membership reports generated from the affiliate portal to determine in which legislative district the member lives to help forward legislation. This can be extremely time consuming, so we have added a column to the CSV report that includes the date the address was modified. As a leader, you can sort the spreadsheet and see only those members who have moved. It is our hope that this will make mapping legislative districts with members much easier!